Positioned as a leading car leasing company in the UK, our catalogue boasts the full range of models within the Toyota range. To find out more about Toyota contract hire, call us on the number below or request a Toyota quote. Toyota is one of the largest car-makers in the world. The Japanese manufacturer sells a large range of passenger cars, commercial vehicles and other engineering equipment. Premium brand, Lexus, is part of the Toyota group, which also owns a majority stake in small-car manufacturer Daihatsu. The Aygo is Toyota's smallest city car, a small but practical five-door that shares a platform with the Citroen C1 and Peugeot 107 and comes with a range of customisation features. The Yaris supermini, also available in five-door guise, boasts good levels of specification and safety features to complement well-known Toyota build qualities and overall reliability. The Auris is Toyota’s entry into the competitive small family hatch market. It is the first of Toyota's existing models to benefit from Hybrid Synergy Drive technology to boost fuel economy and cut emissions, and comes in more spacious Touring Sports form. The best-known model with hybrid technology within the range, and arguably in the market, is the Prius. Now in its fourth generation it continues to offer excellent levels of fuel efficiency and carbon emissions with the Plug-in version offering 22g/KM, and you can also select a seven-seat Prius+, Europe's first full hybrid seven-seater. A look into the future brings the Mirai, which is Toyota’s first hydrogen fuel cell vehicle. 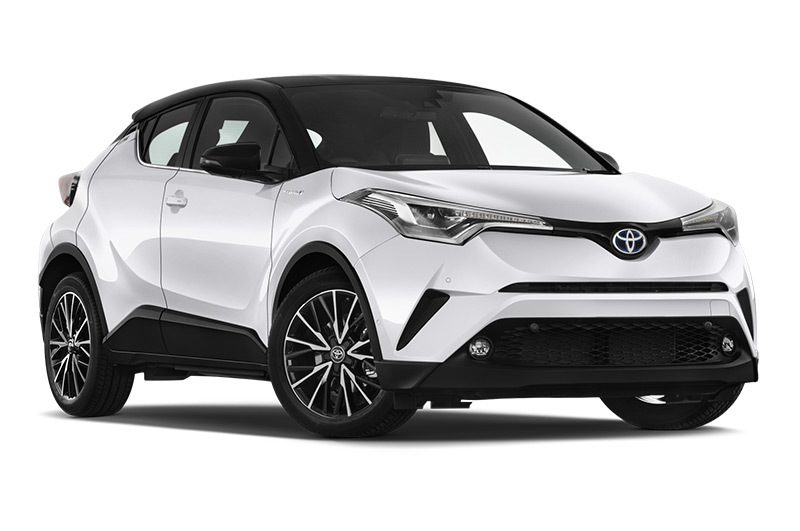 A sporty alternative in the range is the C-HR, it is a small SUV crossover with style and technology combined. It comes with a range of powertrains, including hybrid technology. The Avensis is a four-door family saloon, with a larger Avensis estate to boost practicality, which is also available for contract hire and leasing customers. Offering more interior space still is the Toyota Verso five-door multi-purpose vehicle (MPV), which offers high specification levels and fuel economy in a sports utility vehicle (SUV) like design. Toyota's off-road offerings start with the RAV4, an enduring compact SUV that offers off-road ability and an impressive level of luxury with the manufacturer's typical traits. Moving up the scale is the Land Cruiser, a large, well equipped and rugged SUV. Completing the range, and for those wanting a splash of dynamism is the GT86, a two-door coupe with powerful 2.0 litre petrol unit. The GT86 is loved by enthusiasts for its combination of value and go-kart like handling. As a full-service vehicle leasing provider, with over 26,000 of our vans currently on UK roads, we know and understand van leasing. Whether you’re looking at a new business van or are weighing up the options between lease versus buy, we are here to really help you make the decision that’s right for you and your business. With over 40 years of leasing experience we know what our customers really value. As well as being able to provide transparent and helpful advice over the initial choice of a business vehicle, we can also advise on the range of leasing products that we offer. From full maintenance, breakdown cover and more included in the monthly price of your lease to a more stripped down package, either browse the options in your own time or one of our advisors will be more than happy to talk you through them. For more information about contract hire or leasing a Toyota, or any other vehicle manufacturer, please contact us on 0345 266 5602.